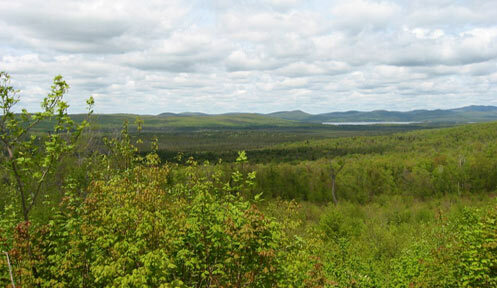 Distribution: Currently known to occur from the White Mountain National Forest north to the Canadian border. Description: 1.1 to 3.1 pounds body weight and 1.5 to 2.2 feet in length from head to tail. Long slender body, bushy tail and rounded ears. Fur color ranges from tawny brown to almost black. 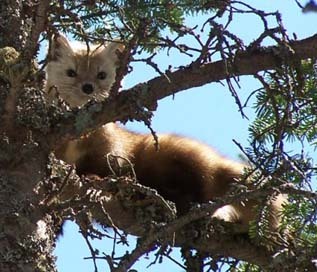 American marten can be distinguished by a characteristic throat patch ranging in color from pale straw to vivid orange. Males are larger than females. Commonly Confused Species: Fisher and mink. Habitat: Mixed deciduous and coniferous forests with a variety of horizontal and vertical structure. Conifer cover is important during winter and course woody debris on the ground provides denning and nesting sites and refuge from predators. Typically found in spruce-fir forests above 2,700 feet in elevation. Diet: Opportunistic feeders but primarily prey on small mammals such as voles and snowshoe hare. American marten are subnivean hunters meaning they hunt under the snow for prey during winter. Will also feed on mice, shrews, fish, small birds, insects and fruit. Life History: American marten begin reproducing at 1 or 2 years of age. Mating occurs during July and August. Females give birth in March or April to a litter of 1 to 5 kits. Females use natal dens where they give birth and then move their kits to maternal dens. Kits become active at 7 to 8 weeks of age and gain more coordination and mobility between 12 to 15 weeks. They are weaned and leave the den within 6 to 8 weeks and are full grown by the time they are 3 months old. Marten have been documented living up to 12 years old in the wild and 15 years in captivity.